"But it should not be that way with you. 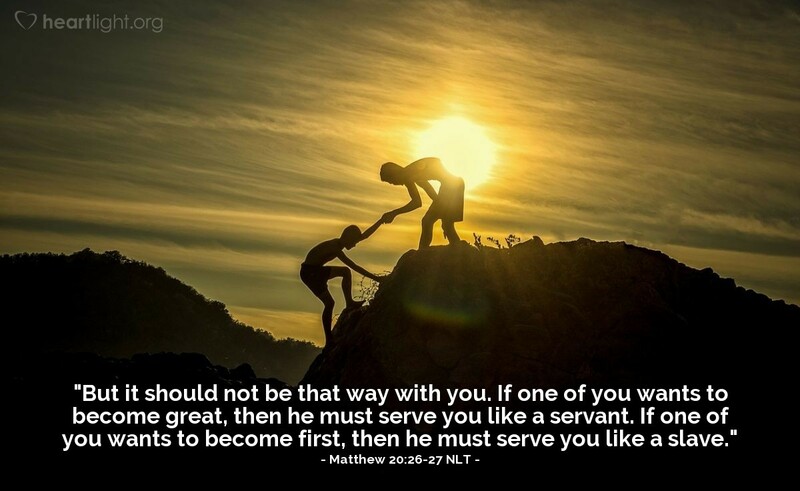 If one of you wants to become great, then he must serve you like a servant. If one of you wants to become first, then he must serve you like a slave." Jesus' Kingdom operates by a different set of standards. Greatness is not found in position. Greatness is not found in the exercise of power. Greatness is not found in being served. Greatness is not found in commanding others. Greatness is not found in wealth. Greatness is not found in intellect. In Jesus' Kingdom, greatness is found in serving. If you are going to become greatest among Jesus' followers, you are going to serve your family Kingdom members. It's that simple. But in case we forget, Jesus gave us the cross to remind us that the path of obedience, the path to greatness, the path of glory is found in serving others while we serve God. Holy and powerful God, you humbled yourself to save me. How can I understand that, much less thank you for it? But I know you want me to show that same graciousness by serving my brothers and sisters in Christ. Make my eyes more able to see and my hands more willing to do for others what you would do for them. In Jesus' name I pray. Amen.